An avenue of honour commemorates those from the district who served in World War One. The original tree guards no longer exist and the names and tree number are listed on the war memorial. 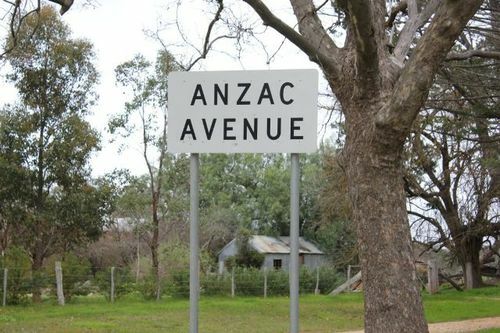 In 2015 a grant was received from the Department of Premier & Cabinet to restore ANZAC Avenue to its former glory. The plans are to replace the missing trees, replace the plaques with the servicemen's names at the foot of each of the 52 trees, erect an information plaque and generally tidy up the Avenue. The planting of trees, in honor of our brave local soldiers, will take place on Saturday next, I7th inst. Miss McKinnon, the oldest resident of Moonambel, is to plant the first tree, which will be planted in memory of Trooper G R Hope, the first of our dear boys to make the supreme sacrifice. Cr W R Samers, J. P., president of the shire, has signified his intention of being present. Splendid preparatory work has been done by the local residents in connection with the avenue which should prove a lasting memorial to the bravest and the best.